We hope you've enjoyed the holidays and are ready for top notch comedy! We’ve got a great line-up planned especially for you. 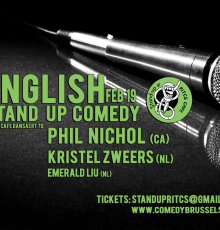 Our februari headliner is none other than Phil Nichol. The Canadian comic racked up the most 5 star reviews ever for his Edinburg show “Your Wrong”. Prepare for another wonderful night out! Phil Nichol is a truly unique performer. An acclaimed actor, award winning comedian, producer, presenter, writer and musician, there is no end to his talent! Phil is an energetic and exciting performer with an unquenchable thirst to break boundaries and innovate with his work. His skill as an improviseris unparalleled. With a surreal edge to his mischievous rantings, Nichol always brings something new to the stage. After starring in the west end musical “Everybody's Talking About Jamie” Phil is embarking on a world tour with his award winning show “Your Wrong” and we are happy to hand over our stage. After she moved to Singapore in June 2013 she started to perform in English. Kristel didn't stay unnoticed. Her straight- forwardness and 'no nonsense' comedy style were received with enthusiasm and have taken her to China, India, Malaysia, Indonesia, Vietnam, Sri Lanka, Australia, Florida, Czech Republic and New Zealand.